Deemed impassable by the Astorians traveling to the Pacific in 1811, the canyon below present day Hoback, Wyoming on the Snake River (then known as the Lewis River) presented a formidable barrier. So much so, Wilson Price Hunt, the leader of the expedition, called the river “Mad River”. Later, many other trappers and explorers expressed the same sentiment. But eventually some did traverse the canyon. 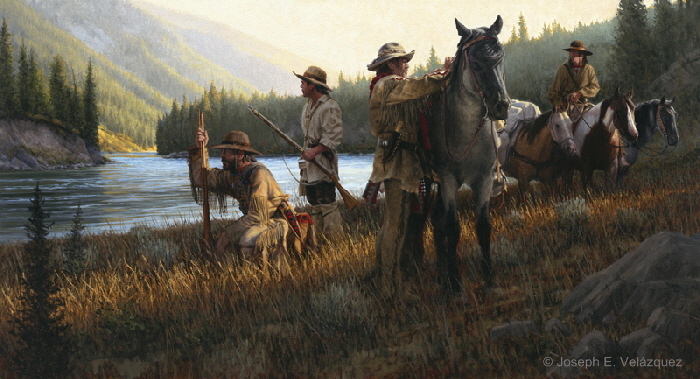 In my painting set in the early 1800’s a group of trappers travel upstream probing the canyon in search of passage. It is late September and the river is running low. With determination and good luck, they may be among the few who finally succeed.